On Friday after Thanksgiving I had to go to work in order to save my nearly nonexistent vacation time. Plus I had some things to do so it was fine to have to go into the office. At least I got out early so I was able to take a nice cruise on the way home with some daylight! On Wednesday I had taken the exact same route in the Miata so I wanted to compare how it would go in the Subaru. Considering the first portion of the drive is uphill, the Subaru SMOKED the Miata in climbing up the hills. Plus it held pretty solidly around the turns although I could not push it nearly as hard. These tires are done for but I knew that when buying the car. Still have to contact the tire shop for an update on when my Falkens are arriving! So the route went from the PCH and up over the mountains onto Mulholland Highway and then Eastward to the Snake. This is a popular area apparently since there were a bunch of tuner cars around there and I always see people driving through there just like you would at the Tail of the Dragon. I’m sure its even more crowded on the weekend but I wont bother dealing with that. 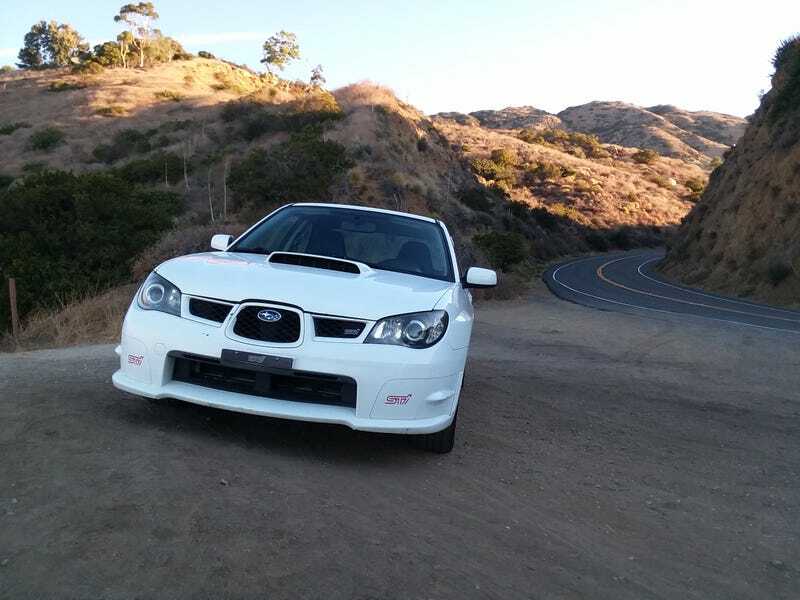 I still have yet to go driving up on Angeles Crest in either of my cars so I want to do that soon. Possibly this Sunday since my girlfriend has brunch plans with her friends. I was finally able to push the car a little bit and really it is quite fun. It has tons and tons of grip, it is very hard to feel where the limit is. Definitely has that “hero car” feel where you think you have infinite grip. But I am sure it is there until it isn’t and then you understeer off a cliff. With better tires, I will feel comfortable pushing it a little further at least though. But so far I can see why “slow car fast” is kind of more fun with the Miata. The Miata has less grip even with my summer tires and coilovers and sway bars and roll bar for stiffness, but I can use over 100% of that grip without dying. But I can have just as much fun in either car but for different reasons. The biggest advantage to miata though is the Bride bucket seat and the 6 point harness, that I missed in the Subaru for sure! While the STi seats are quite grippy, the difference was noticeable. But its a compromise I am glad to make for a little more comfort on longer distance trips.